On Mondays we deal with grief issues. One of my very first readers, Annette, suggested these questions for widows: Should you move? and if so, how soon should you move out of your house? Here are some wise words from other's experiences. Bridgette: Not only did I move to a new house, but I moved 700 miles away. It was and is bittersweet, but I don't regret it. We needed a fresh start where we weren't constantly reminded that Kent isn't here anymore. Polly: I moved 300 miles away, leaving behind everything I had ever known. My heart is still there and it will always be home. Still, it was the absolute, without a doubt, best thing I could have done. Memories are wonderful and painful at the same time ... they were everywhere I looked, in every nook and every cranny. I slowly began to see I would take those memories with me and perhaps lessen the pain a little. I miss home. My oldest son and several grandchildren still live there. Until last summer, when I went to visit, I could not bear to even look at the street with our house, nor could I go to the cemetery. Last time my son said "Mom, let's go for a little ride and look at some of the country." We drove by our house and through my tears, I saw it for the first time. I squeezed his arm tightly as he drove on to the cemetery. We both got out and it was like a healing! Now I can go and be so grateful for the time I had, take flowers and feel the joy I knew 'back in the day' once more. My son is very wise, indeed! Annette: After two months I made a big move from Shelbyville, TN to Wisconsin to be with my children and grandchildren. I know this is where I need to be but I think if I had to do it over again I might have taken a few more months to get thru my grieving period. We had been married for thirty five years and it was really hard for me to think about life without him. Moving up here and being with my grandchildren helped me to get thru it. The most important thing for my life was that God was by me thru it all. He was there in the night when I would wake and cry out in loneliness and he gave me such peace and joy. Myra: I became a widow 15 years ago at the age of 39; my daughters were 10 and 5. I decided to stay in the house. The kids were with their friends and we had our church family. Had I moved back to my home town, I would have had to be totally dependent on my parents. At 39, that was just not feasible. I am so glad we did stay. I have a close widow friend, whose story very closely parallels mine, but she chose to move to the town where her brother lived. She says she wishes she hadn’t. She left behind not only the memories, but her friends and her boys’ friends as well. I would advise anyone to wait at least a year if children are involved and a couple of months if it is just the spouse. Give yourself time to make the right decision for you and your children, not for your family, even though they feel they are giving you the best advice. It’s your life and you have to live with the decisions. You must begin to make decisions on your own, as tough as it is. MaryLou: Our house had been up for sale and when it sold I did move because that had been our plan . . . but *everything* in my life changed. I moved from Kansas City to Colorado Springs. I have a lovely, sunny, fully-equipped apartment on the lower level of my daughter and son-in-law's home, but my life was ripped out by the roots and plunked down in a "foreign" soil. I struggled to make good friendships and find a church home etc. I never liked "change". I had lived in the same house for 30 years and in the same town for all of my married life. The Lord was really stretching me. What about you? 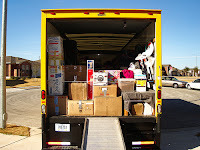 Have you moved or thought about moving? Jump in and tell us about your experience and any advice you can pass along. Please click the comment line below and fill in the box or email your insights to wcplace@gmail.com Thanks! I know a lot of ladies prefer to move out of their homes because of all of the memories in the home, or they have to move because they cannot afford to stay in the house. I would not move from the home Ben and I shared for anything and thank God I am able to afford my home. I like having all of his memories around me. It makes me feel like he's with me. My husband died 13 months ago. We had a farm, and I have not moved nor considered moving as of yet. We had lived in this house 30+ years. It's my home and it's a safe and comfortable place. It is a place for me to think and reflect. My 3 children were out of the house, but they did have difficulty at different times coming back to the house they grew up in. We have celebrated the holidays in this house as well as, his birthday, and even Easter (my husband died on Easter 2011) . We had a special memorial on Easter with all of his brothers, their children and their children’s children on Easter. We dedicated a tree, read a poem, released balloons and had an Easter egg hunt for the kids. It was good. My oldest daughter did not attend, but that is ok. She needed to deal with her journey that way. Maybe I will move when I decide what I want to do with the rest of my life. I have learned that everyone who loses someone is on their own journey. I can not compare, but only listen and try and understand where the other person is going and accept their journey as their own. If I can help along the way, I will.